I am convinced that data is the ultimate public good. what makes our analysis and data stand out. Central bank flows for 30+ economies. Global cross-border portfolio flow and M&A flow tracking. Real-time capital flow indicators for China (as part of China Flow Analytics). Forward looking modelling of CTA FX flows. The data service is complemented by our ongoing thematic analysis of flows, including key forward looking and actionable insights, provided in email and blog formats. Fill in your email address to receive more information about how our tools can help. I agree to have Exante Data email me further information about products and services. In latin ‘ex­ ante’ means before the event. In economics and finance it is important to distinguish between expectations ex post (after the event) and ex­ ante (before the event). Delivering superior trading and investment results entails forming views ex ante; before new information moves the market. Making decisions ex post is typically costly, especially in today’s fast­ moving information driven markets. The concept of ex ­ante is so important that we have embedded it in the company name exante data. exante data delivers proprietary data and innovative analytical solutions to professional investors globally. The goal of exante data is to build a bridge between new technology that allows extraction of information from a myriad of new data sources and macro strategy. exante data uses a data-based approach to provide insights into future macro dynamics. The aim is to provide reasoned answers to the most difficult global market questions before the market consensus. 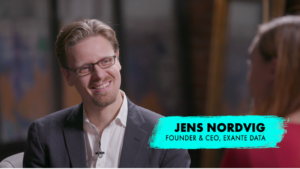 exante data is founded by Jens Nordvig and comprised of a group of macro strategists, data scientists and computer scientists. In addition, exante data is partnering with leading academics and specialists technology/data firms globally to create innovative proprietary data sets and analytics. The core team of exante data and exante advisors is based in Manhattan, New York. for distribution and or analytics to complement your data, please reach out to us. exante advisors is an independent research consultancy providing macro strategy to a small and exclusive group of influential market participants. The focus is on in-depth macro-thematic research, capital flow analysis, and data-driven and probabilistic investment and trading strategy. The approach is cross-asset, but with particular emphasis on currency and interest rate expressions of macro views. exante advisors has added additional research staff and now has capacity to onboard a few new clients over the next 6-12 months. If you are interested in partnering with exante advisors in the future, please click the link below. We will follow up as soon as possible. Clients of exante advisors can login here.